Last week I had a hectic but fun time stewarding our “Missing Elements” exhibition with my Room 6 colleagues at the Ally Pally Knit & Stitch Show. As I’m now rehydrated (it was very warm) and have caught up on missed sleep, I thought I’d share my highlights from this year’s event with you. As usual Upper Street Events put on a great do. There was an inspirational line up of artists in the Textile Galleries where we were honoured to have been allocated exhibition space. I didn’t have much time to go around the show in it’s entirety as I was too busy chatting with lots of lovely visitors. However, I did get to look at the other exhibitions in the mornings prior to opening once our own space was ready and my caffeine needs had been seen to. I’ve included some of the work that resonated with me below. This artist was new to me and I found her mix of social commentary and mostly monochromatic, illustrative imagery and sculpture compelling. She was encouraging audience participation by asking them questions and using free machine embroidery to record the answers on to an automaton’s clothing. The Harm Chair, featured above, was a finished piece from a similar exercise where she had asked “what keeps you in your chair and not mixing with others?” on social media. I shall be following this artist with interest to see what question she poses next. I’m not sure Jenni was quite prepared for the amount of emotion that her large scale portraits of her mother would evoke in her visitors. When I popped my head around the partition on the first day she was handing out the last few sheets from an already empty box of tissues. It was quite difficult for me to spend time in her exhibition space as so many of us could relate to her lovingly rendered and honest images. I must admit that I did have a little cry and had to snuffle away when I viewed the pieces of her work which reminded me of the drawings I made of my Dad during his last few days. On a more cheerful note Dawn Hemming’s large hand knitted, one piece, circular wall hangings were a delightful mix of motif and colour. They were named inspired by place and some had been made during travel. A lot of pins were used to hang these beauties on the walls (Dawn’s “assistant” was relieved and pleased with himself in equal measures I think after the hanging was completed) with the result a welcome splash of colour to greet visitors as they entered the hall. This one was definitely a mood lifter. Studio 21 had an interesting and varied exhibition as usual, this time based on colour. I enjoyed Ross Belton’s contributions, with their tribal art feel and textural richness. The final artist I wanted to mention here is Emily Tull and her hand stitched thread paintings. I was particularly drawn to the unfinished feel of the work. It gave me a sense of transience and a glimpse into the perpetual motion of the lives of the people she was portraying. The piece shown above is inspired by layers of ripped wallpaper and how the inhabitants of homes leave behind a bit of themselves when they move. Chick, Duck and Hen (reading from left to right). And finally, thank you to all the wonderful folks who visited our Missing Elements exhibition. It was great to hear what you thought of it and a particular delight to see how it inspired the budding young textile artists who visited with their schools and colleges. The exhibition will be travelling to the Dublin show in the next few weeks. Unfortunately I won’t be able to attend but if you are going, my Room 6 colleagues will be there to meet and greet and answer any questions about the work on display. I am excited to tell you that after a few years off, I shall be exhibiting again at the Knitting and Stitching Shows this year. My work will be alongside the five other talented artists who make up Room 6: Irene Belcher, Caroline Bell, Susan Chapman, Alison Hulme and Consuelo Simpson. We are a group who come together for exhibitions but work individually. We make to themes to create a cohesive show while allowing our artistic individuality to shine through. For the Knit and Stitch Shows we chose the title of “Missing Elements” and each artist has responded to this with their own body of work. Expect a varied exhibition, both interpretation of the theme as well as media and style. Those of you who have followed my work for a while know that animals are my usual muses but I also have a fascination for the human body. This is driven by my other identity as a sports injury specialist and movement rehabilitator. I am also interested in the use of language and inspired by Pop Culture. It is these seemingly disparate sources of artistic interest that have come together in my body of work (no pun intended) for Missing Elements. Read on to find out how I’ve made the connection. Bird, chick, duck and hen are all words used to describe human females. The first two are commonly prefixed by a male possessive “my”, while the latter are considered terms of endearment in certain parts of the UK. Interestingly, Bird and Chick are two of the four most hated “pet” names by women according to a well known British Tabloid. Many suggestions are given as to why women are labelled in this way. These range from a middle English word “burde” meaning “young woman”, through to the more misogynistic explanations. These include comparisons of mental ability between our feathered friends and those of us of a homogametic persuasion (“bird brained”), and the similarities in sound emitted from a pen of fowl and a room full of young women. Misogyny or endearment aside, while we may all share eggs as our reproductive tools, according to the Collins English dictionary a bird is a creature with feathers and wings. I would therefore suggest that the most defining characteristics are missing. I started to develop the visual side of this work during this year’s 100 day project (I’ve talked about this in a previous post) back in June . These are two of the sketches that provided that aha moment. It’s been a couple of years since I made a knitted painting and these drawings were really begging to be knitted. So I dug out the graph paper and my colouring pencils and went about translating these pictures into hand knitted fabric. Of the work that I have created for this series I have decided on four knitted paintings to display at the shows. I am excited to see (and hear) what people think of them. As with all of my work I hope it brings a few smiles to a few faces. I’ll leave you with a sneak peek of part of the piece I’ve called “Duck”. I’ll be stewarding at the Ally Pally show if any of you lovely folks are coming. Please do drop by and say hi. I’d love to see you. An October highlight for UK textile enthusiasts is the Knitting and Stitching show at Alexandra Palace in London. Not only do we get to fill our boots with yarny goodness, it is also an opportunity to catch up with fellow enthusiasts from the Textile World, find out who is new and inspiring, and some of us get to spend a day with our wonderful Mums! I was particularly excited this year as a friend of mine, the super talented and rather lovely Sarah Waters, had a solo exhibition in the textile gallery. I couldn’t wait to see what she had done with it and as expected it was amazing. Sarah is an experienced felt artist based in the UK’s New Forest. Her work is inspired by our connection to nature and she has a particular interest in sustainability. Her exhibition at the Knit and Stitch shows this year consists of large scale wall hangings, rich with texture and full of beautiful natural colours, depicting stone, the natural inspiration behind it. Felt sculptures add a three dimensional element to the exhibition. Sarah’s exhibition will be at the sister shows in Dublin and Harrogate so if you are lucky enough to be going to these I highly recommend you pay her a visit. More information about Sarah and her work can be found on her website here. Another gallery which stopped me in my tracks for a better look was Ann Small’s Layered Cloth exhibition. She has recently published a book of the same name and the work she had on display tempted me to add it to my Christmas List. Beautiful ruffles, folds, puffs, slashes, you name it, anything you can do to create a three dimensional effect from stitching and fabric was here. Her work made me smile, it had a sense of fun to it as well as a technical wow factor hence I wasn’t surprised when I read that she has a background in theatre and fancy dress costume making. More about Ann and her work can be found here. The final artist I’d like to introduce you to in this post is possibly my new favourite textile artist having not come across her work before. Rachael Howard’s gallery “Red Work” consisted of large scale grids of colourful, simplistic illustrations depicting everyday family life. Her inspiration for the exhibition was taken from 19th century red work story quilts and she likens the effect of these historical textiles to modern day Instagram. Her work is rich in humour, is very accessible and evokes a personal narrative from the viewer. If you get a chance to check out Rachael’s art she has a website here. In this post I’ve mentioned three of my favourite galleries from this year’s Ally Pally. There was so much to see I always wish I can have another day to fully appreciate everything but unfortunately dog dinners awaited and we had to dash off. We didn’t leave without a bit of shopping though (my Mum is such a bad influence on me!). 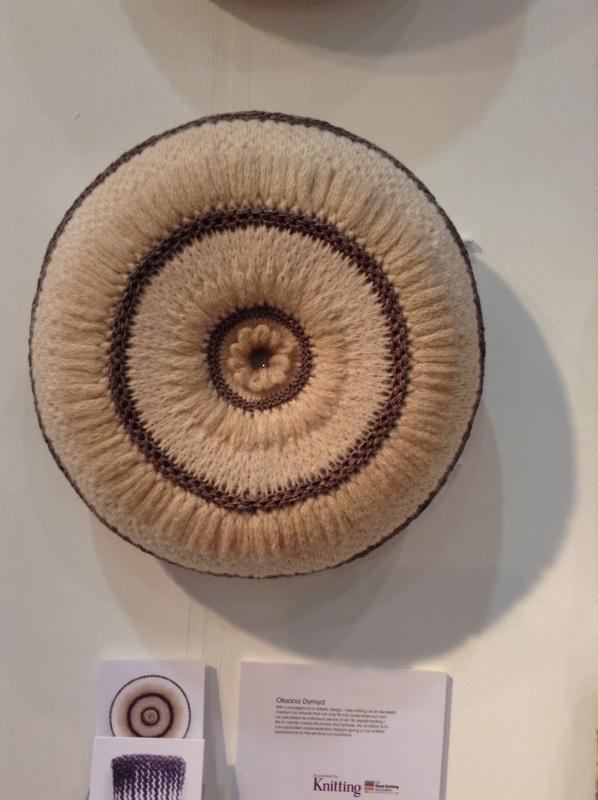 Please feel free to leave a comment on this post if would like to share a highlight from this year’s show and if you are visiting the Dublin or Harrogate Knitting and Stitching Shows I hope you have a wonderful time. A number of you lovely people who have bought the set of dog portrait knitting charts have asked me for some guidance on how I made up my blanket. So if that is you, please read on for hints and tips on how I put the portraits together. I used four balls of Rowan Creative Focus worsted (100g) (black) and seven Rowan Kid Classic (50g) (shade 885, cloudy). Using 4mm needles and working on 48sts and 61 rows my portraits came out at 26cm square. Please note that most of the charts are 48sts wide by 61 rows high. However when working out your tension be aware that the Retriever and Spaniel charts as printed are 49sts wide (61 rows high) and the Greyhound is 62 rows high. Repeating the above, I created six cable lengths that fitted the height of the portraits and attached them to the inside borders of the edge portraits and to either side of the central portraits. I then made two more long cable borders to fit the entire inside width of the blanket and attached them. I put a moss stitch external border around the whole blanket as follows: using 4mm needles and the black by picking up and knitting 48 sts per square and 7sts per cable band along the top and bottom of the blanket. I worked 4cm in moss stitch, knitted a garter stitch turning row on the WS, changed to the grey and continued in stocking stitch for 9 more rows. The side edges of the blanket were then picked up and knitted as per the top and bottom, adding in an extra 6sts at either end for the top and bottom border bands and completed in the same way. Wow, what a week! 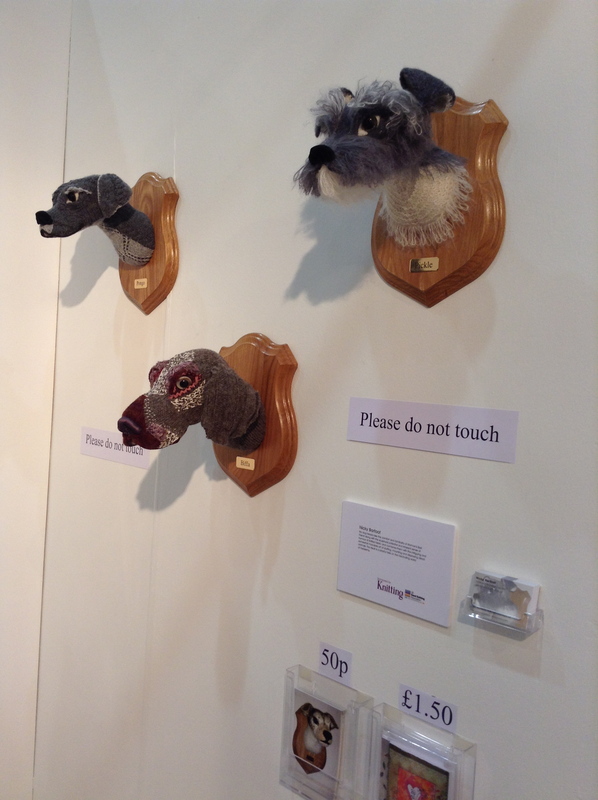 I had an overwhelming response to my knitted dog heads at Ally Pally from the thousands of lovely visitors to the Knitted Textile Awards stand. If only I could have captured on camera the smiles they provoked, particularly Pickle the fluffy terrier. I got lots of interest in commissions, was shown lots of pictures of people’s dogs and even got to stroke a little chihuahua who had been smuggled into the show in a handbag! Probably the funniest comment from viewers was a lady who laughed out loud at Pickle stating “that dog has eyebrows just like my Dad!”. The stand looked fantastic this year, thoughtfully curated by Sam Elliott from Kingston University, and it showed off the work of the finalists beautifully. In the Open Category we had plenty of knitted sculpture to keep my doggies company including a full size brown bear by Heather Drage of “Born to Knit”, a cheeky seagull enjoying a feast of fried chicken by Claire Sams, and the ENTIRE cast of the Hobbit (minus the dwarves as there wasn’t enough room!) by Denise Salway. In contrast to the sculpture there were some lovely crochet baby shoes with sparkly soles by “This little”, a striking picture by Tina McCara, a wonderfully wearable asymmetric jacket by Becca Tansley, Babsi Cooper’s sculptural crochet dress inspired by the Yorkshire countryside, a colourful crocheted unisex T by Matthew, aka one man crochet, the cutest kiddy colourwork clothes by Anita Joyes, and last but by no means least some gorgeous hand knitted cushions by Oksana Dymyd. And this was just the open category! The graduate competition was also amazing in its diversity, managing to be both inspired, technical and wearable all at the same time. I didn’t envy the judges their job and many of them told us afterwards how difficult they found it. We await the results at Harrogate. 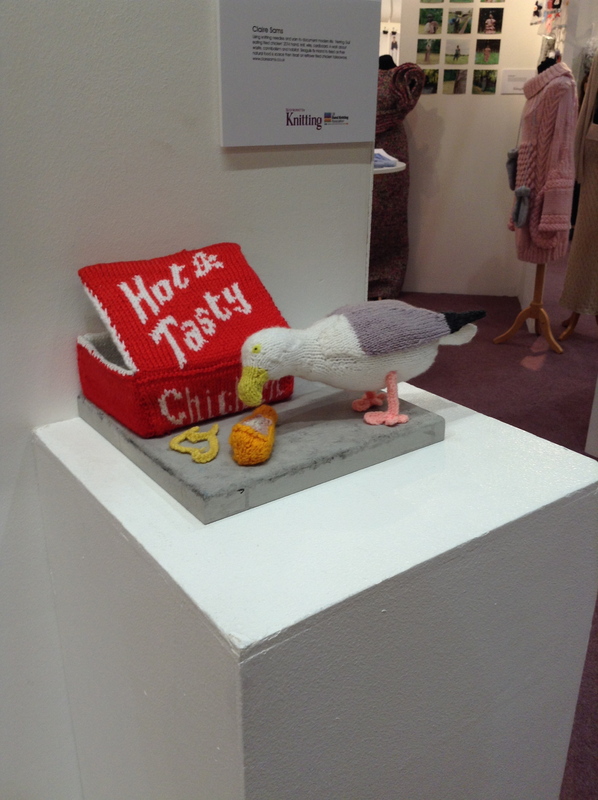 There was also some inspiring work on display at the Knit and Stitch show by other artists and makers this year. I think my favourites were Renate Keeping and Jean Bennett. More on them in another post. That’s it for now. After a week away being looked after by my Mum, real life and the day job now beckon. 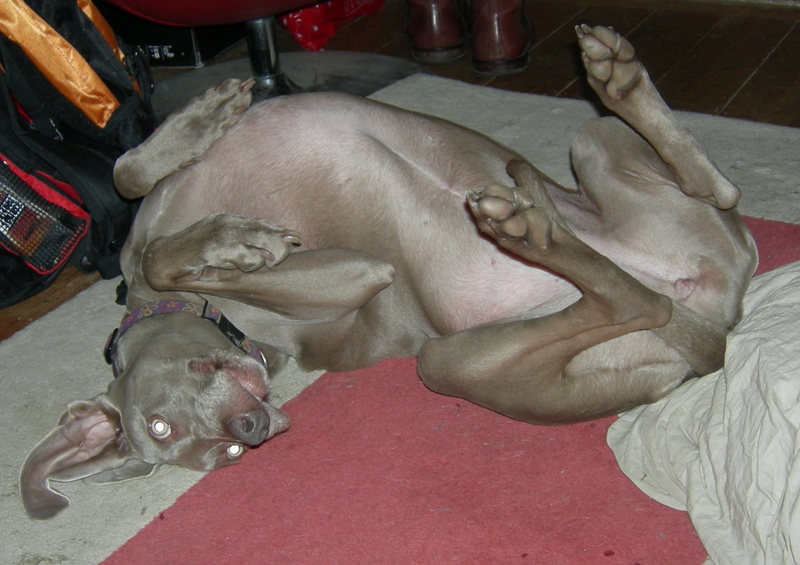 Firstly though a wet and muddy run around the woods with a hyperactive and neglected Weimaraner.